It’s not their fault. Not EVER. It’s always your fault. His fault. Her fault. To a narcissist, it’s not their fault they hurt you, it’s your fault for being hurt-able. If your feelings are hurt, it’s not their fault; it’s your fault – for having feelings. (You may be told that you’re “choosing” to feel bad about the hurtful things they’ve done, and that it’s the wrong “choice”.) If caught doing something insensitive or selfish, they will tell you they “had to” do it because of someone or something else. If you imply that anything is their responsibility, they give you excuses and lies, and often, if those fail to work, they will finally make it clear that the bottom line is they simply don’t care because they don’t have to, and the fact that you care is just unnecessary or wrong. From their perspective, you shouldn’t care — you should get it right like they do, and be more like they are. Uncaring. Narcissists lie to make themselves look good. They lie to get out of emotional responsibility. They lie to gain influence. They lie out of habit. Life is a game to narcissists – a game they have to think they’re winning – and truth is one casualty in their game plan. The only time a narcissist has any interest in telling the truth is when it will serve them or cost them nothing to do so. The rest of the time, they don’t consider it necessary or important to be all that honest. Honesty can impede their self-gratification and compromise their powerful persona, and they don’t like that. To narcissists the truth is frequently “flexible” and optional. There’s no such thing as an honest narcissist. 3. THEY LOOK DOWN ON YOU. Narcissists have to make themselves feel bigger by convincing themselves others are smaller by comparison. They’re no strangers to being condescending, snobby, clique-ish, elitist and superior; however, they may be very good at hiding their disdain to prevent a loss of popularity, which narcissists know brings them power. Narcissists with money look down on the working class. Narcissists in the working class look down on those with more money. Educated narcissists dismiss the opinions of those who have no degree. Narcissists with no degree claim educated people don’t actually know anything. Whatever narcissists HAVE (or think they have) is what they use to look down on others WITH. No-one else’s background, appearance, values, political persuasion, school, preferences, religion, way of life, profession or opinions are ever any good or worthy of their respect unless they themselves value and/or possess the same. If you think or choose differently from a narcissist, you’re “wrong”, and they’re “right”. Narcissists literally have two faces — their real face and their stage face. And neither is anything like the other. Which one you see will depend on how long you’ve known them. Narcissists can be very charming and know how to gain favor. Anyone who doesn’t know a narcissist well will tell you the narcissist is one of the greatest people they’ve ever met! They believe this is one of the most intelligent, kindest, most interesting, funny, agreeable, most attractive, talented or accomplished people ever. They may wish they themselves had it so “together” or were so popular. 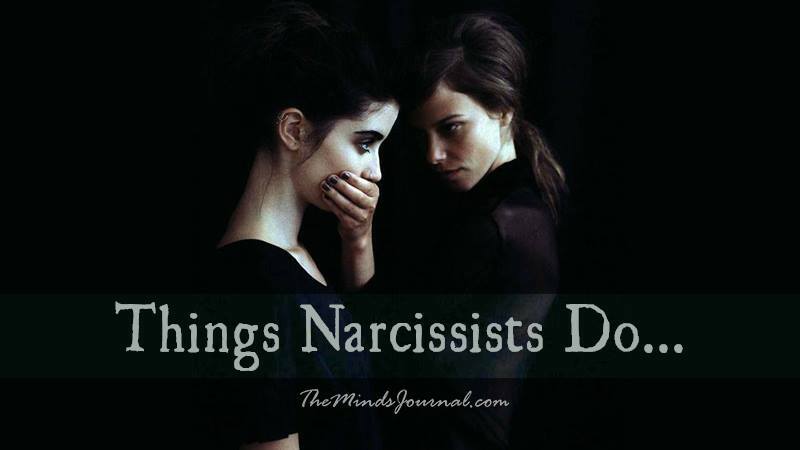 However, anyone who knows that same narcissist better (family members, longtime coworkers, etc) will tell you the narcissist is one of the most horribly frustrating and toxic people they know, and the mere mention of their name makes them feel uneasy, angry, frustrated or otherwise unhappy. Being the only one who is experiencing a narcissist’s real face, while all other family members or coworkers can still only see the narcissist’s stage face is a very lonely, painful and frustrating place to be. Thankfully, the number of people who can see through the facade tends to increase with time.